The DopaFuse drug delivery system consists of a reusable custom dental retainer, its case, and a pre-filled, single-use container which continuously releases drug into the back of the mouth. When the system is worn, a levodopa/carbidopa paste is delivered to the back of the mouth, swallowed with the saliva, and absorbed through the gastrointestinal route. The drug is delivered at such a slow rate that the patients usually do not notice the delivery. Two to three times per day, patients dispose of the container and replace it with a new one. The DopaFuse System is easily removed and stored for activities such as eating and tooth-brushing. To store the system, patients remove the retainer from their mouth and place it into the case, which stops the flow of drug. When the patient is ready to use the system, they simply remove the retainer from the case and the drug begins flowing again. The system is convenient and discrete. 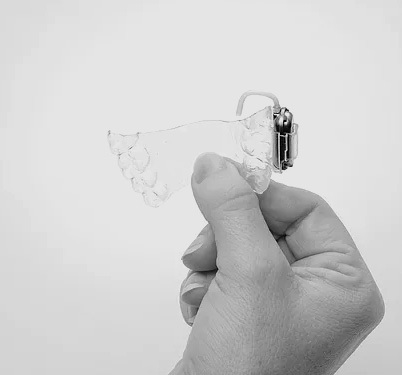 The clear retainer is virtually invisible to others and is custom made to ensure comfort for each patient. Federal law limits the use of DopaFuse to Investigational Use Only. DopaFuse is not available for sale.